I made one too many head wraps for gifting and couldn’t stand to see it go to waste. I’m kidding, of course. 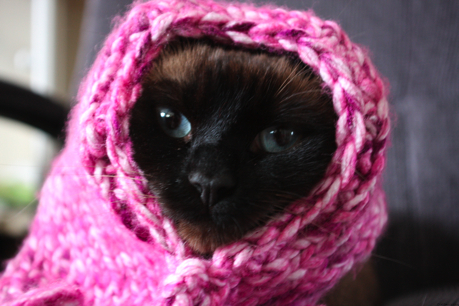 If this was really a head wrap for Justine, our patient cat, I would have made it a lot smaller. I hope you folks endured less harassment than Justine at your holiday parties and had a merry time. Happy holidays! Are you missing your CraftSanity Magazine?